The Place I initially thought Takayama Japanese Restaurant at OUE Downtown is with reference to the city in Gifu Prefecture in Japan, but it is actually the name of its Head Chef, Taro Takayama. 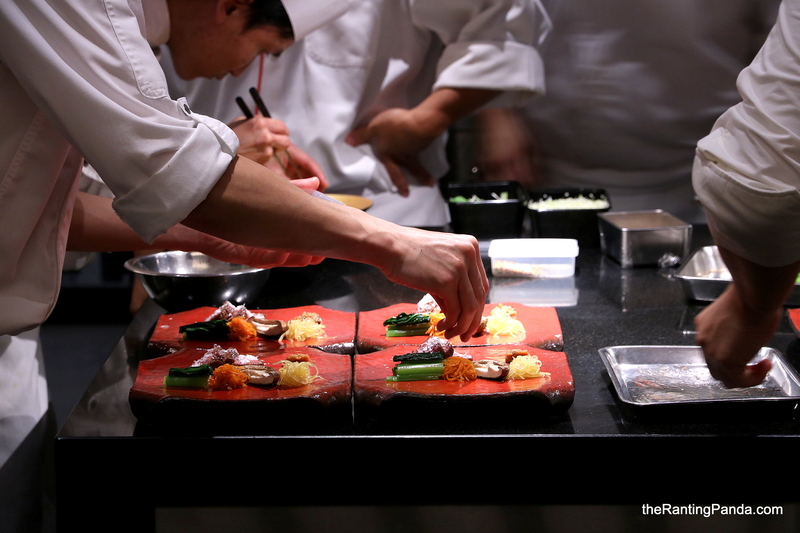 Chef Taro used to be the Chef de Cuisine at Mandarin Orchard, before setting up Takayama early this year. The Japanese fine dining restaurant is a kappo-style restaurant with a menu inspired by the different seasons of the year. The main dining room features two counters for seven and five guests respectively, as well as a private booth that seats two and another that seats four. Go for the counter seats where you can watch the chef in action. If you fancy some privacy, there are two private dining rooms for six and eight guests respectively. The Food I didn’t purely try Chef Taro’s dishes during my visit, as I went for a special 11-course Four-Hands Dinner by Chef Taro and Chef Kentaro of Two-Michelin starred Shisen Hanten, which is also by the OUE group. The special menu features a mix of both chefs creations and dishes which they both work on together. On usual days, lunch set menu starts from S$68++ per person while dinner is at S$280++ per person for a 10-course meal. One of the appetiser which left an impression on me is the Dadacha-mame with Japanese summer vegetables by Chef Taro. Imagine having Edamame ice cream, that is the gist of the dish which showcases different types of edamame beans. My most memorable component here is the edamame ice cream, which has an unforgettably smooth texture and well-balanced flavours. The other enjoyable dish is the Hairy crab with tofu by both chefs. This dish is essentially chawanmushi, which has a nice sweet flavour from the hairy crab. It is not the most surprising dish of the night for me, but I enjoyed it nonetheless. What’s a Omakase meal without fresh sashimi? The Seasonal fish from Japan is also on the usual menu at Takayama and is served in a beautiful platter of various sashimi assortment such wild caught salmon and otoro. One of the best dishes I had is the Beijing duck with foie gras created by both chefs. The roasted Peking duck here is wrapped in the pancake along with a small scoop of foie gras ice-cream which seem like a mismatch at first thought. What took me by surprise is how subtle the foie gras ice cream flavour is, which blends perfectly with the crispy duck skin and delicious duck meat. It is a very sublime dish. I love a good piece of Japanese Wagyu beef and the Grilled Kumamoto wagyu with Japanese mushroom is another of my favourite from Chef Taro. The tender A4 grade wagyu beef is succulent and is only lightly seasoned. If you enjoy your wine and sake, there is a good range of options at Takayama to go along with your meal. Rants There is no ala carte menu here, with only the Hazuki 10-course set menu available during dinner at S$280++ per person. Will I Return Again? While a meal at Takayama doesn’t come cheap, the quality of the dishes is sublime and refined in a Japanese style dining ambience. Go for it if you enjoy kappo-style omakase, though you might want to save it for a special occasion. Make your reservations instantly at Takayama here.